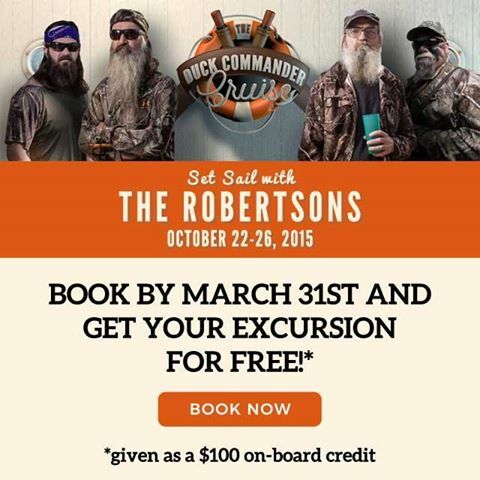 If you sign up for the Duck Commander Cruise before March 31st, then your excursion is FREE, Duck Dynasty’s Si Robertson announced on Facebook. The new Duck Commander event will take place in Bahamas from October 22 to 26 and features Phil, Si, Miss Kay, Jep, Jessica, Alan and Lisa Robertson and their friend Justin Martin and John Godwin. “Are you ready to visit the Bahamas with the Robertsons? Join Phil, Miss Kay, Si and some of the Robertson family on a cruise adventure to Nassau and Freeport, Bahamas. Hear stories from Si, Jep, Martin and Godwin on what it’s like to work together each day, and you know that Si’s stories will be, well, told only as Si can tell them. There will be time to ask questions of some of the Robertsons on everything that you have wanted to know about their family. And we elected Phil “The President” on the last cruise, we can’t wait to hear what he’s got to say this year!